*This column was originally published for EvoShield. How often do you hear, “Oh this is the best seat in the house?” Usually, it’s an expensive seat right behind home plate, a luxury box, or right behind the dugout. Anywhere in the stadium is a great place to watch the game, because you are live in person watching the game, but you can’t beat the bleachers. 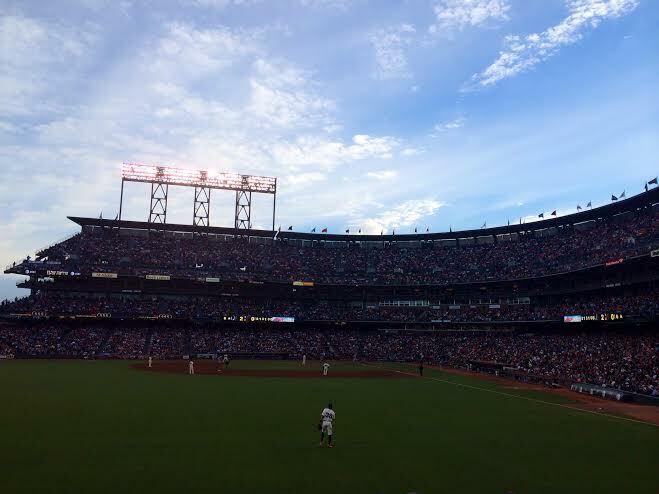 Bleacher seats are the heart of baseball fans. If you are sitting in the bleachers, your back will probably hurt after the game. At some point you are bound to get kneed in the back, and there’s always the ultimate fan in the front. I just took in a San Francisco Giants versus the Los Angeles Dodgers game, and found the truest fans to be in the bleachers. AT&T Park is no new place to me. The bleacher seats are. I sat right behind the Dodgers dugout for Barry Bonds’ 500th home run, have sat right next to the opponent’s bullpen when Clayton Kershaw threw, and have sat in the club level seats to see Tim Lincecum throw. Nothing beats the bleacher seats. The first thing you see in the bleacher seats, is that one special fan who thinks if you don’t lose your voice in the first inning, then you are a terrible fan. In my case, that fan was a guy with dreadlocks going down to his Giants jersey, and a worn-down old Giants hat. He tried starting every chant possible, and would put his hand to his ear like Ric Flair if you weren’t loud enough to his standards. If we weren’t loud enough, he would yell, “Y’all sorry!” Sorry, Ultimate Bleacher Fan Guy. What lures people to get bleacher tickets, is of course the chance of catching a home run. Any ball that is hit in the air, is a possible home run ball in the eyes of the fans. It can be a popup to the third basemen, but the fans will be ready for a possible prized baseball. Not only are the bleachers usually always the rowdiest fans in the park, a rivalry amplifies that by an uncountable amount. Try going to a Giants versus the Dodgers game in the bleachers. From the most innocent looking Giants fans you hear, “There’s a gross amount of blue in the stands tonight.” Then, the rivalry of chants begins. Of course, the famous “Beat LA!” chant was heard of and over. To that, a red-headed Dodgers fan a row ahead of me kept yelling, “First place Dodgers!” One clever fan said back, “Last place fans!” The bleachers during a rivalry game is a battle of fandom, always trying to out cheer each other. If you don’t get a home run ball, there’s still another chance for your prize. In between innings the outfielder usually throws the ball he uses for warming up, to the fans in the stands. Most of the time, the ball just goes to the first few rows. I was in the ninth row and there was one time I had a real chance at my prize. The ball was in the air, I became seven years old again, and went for the ball. To my disappointment the ball went about two more rows behind me and the prize was in someone else’s hands. From the bleachers, I came home to a sore back, a weak voice, and beer spilled on my back. A true baseball fan. Somehow the bleachers bring the true fan out of you. If you want to get on TV, be my guest and pay extra money to sit next to people who know nothing about the game. If you are a true fan, gather your friends to the bleachers where your true baseball family will be waiting to cheer with you. *All pictures taken by me. ‹ Chase Headley: Who do the Yankees get?